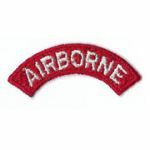 WWII AAF Airborne Troop Carrier Patch. Three inches tall. Fully embroidered. This is the variant with the khaki twill between the two pieces. Unused. 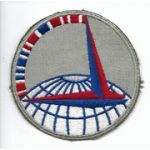 WWII AAF Air Transport Command Squadron Size Patch. Four inches in daimeter. Fully machine embroidered. Unused. 1119th Base Unit Air Transport Coomand Patch Set. Italian made. Two piece. Heavy gold bullion details. A couple of small bug bites to the arc. Unused. 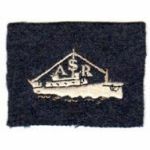 WWII AAF Air Sea Rescue Airborne Tab. Fully machine embroidered. 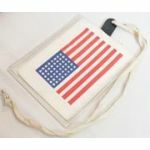 This is worn above a AAF HQ patch or 5th Air Force patch. Unused. 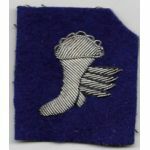 WWII Army Air Forces Air Ferrying Command Patch. Fully machine embroidered. Unused. 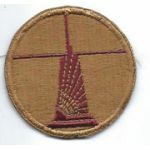 WWII Air Ferrying Command Civilian Personnel Patch. Fully machine embroidered. Used. 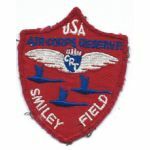 Pre-WWII US Air Corps Air Cadet Patch. Machine embroidered o a black wool background. Used. WWII Army Air Forces Westover Field, Mass. Patch. Machine embroidered on twill. Used. 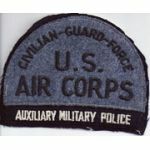 Army Air Forces Tech Rep Patch. About two and a half inches tall. English hand embroidered. 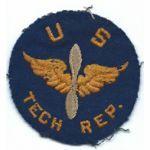 Removed from a uniform. 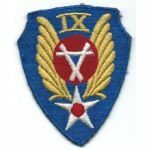 WWII - Occupation IX / 9th Aviation Engineers Patch. German machine embroidered, almost feels like silk woven. Used. 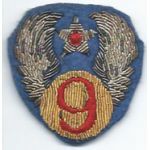 WWII 9th Air Force Heavy Bullion Patch. Thick, heavy bullion embroidered on a blue wool background. English made. Used. 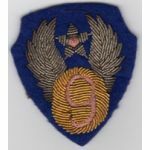 WWII-Occupation Period Theatre Made 9th Air Force Patch. German bullion details on a felt background. Has been used. 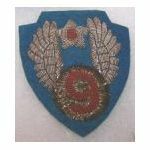 WWII Bullion 9th Air Forces Patch.About two and three quarter inches tall. Hand embroidered with bullion details.Looks English made. Unused. 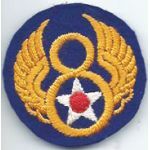 WWII English Made 8th Air Force Patch. Blue wool background with English hand embroidered details. Used.